Since its first big-show preview at NAB earlier this year, VELVET Light’s R&D department have been working hard to finalise their latest addition to the ever-popular VELVET Light product range. EVO 2 shares many of the characteristics that have made VELVET Light the go-to professional LED lighting source throughout the industry. Class-leading IP54 weather protection, soft & uniformed light output & passive cooling are to but name a few. The trick up EVO 2’s sleeve is a technology called ‘5LED’. In essence, there are 5 types of LED packed into EVO 2 – Red, Green, Blue, White & Cool White. Moving away from ‘daylight’ & ‘tungsten’ LEDs opens up a range of possibilities. First off, colour temperature is much-expanded, covering a 2,500°K – 10,000°K range. Beyond this are a vast plethora of colour options – replicating traditional gel covers – as well as lighting effects such as paparazzi camera flashes & fire flicker. EVO 2 can be controlled on-panel, with DMX or by using the companion mobile application – available for iOS & Android. Joining EVO 2 in the era of full RGB light fixtures, BB&S Lighting have revolutionised their renowned Area 48, creating Area 48 Colour. 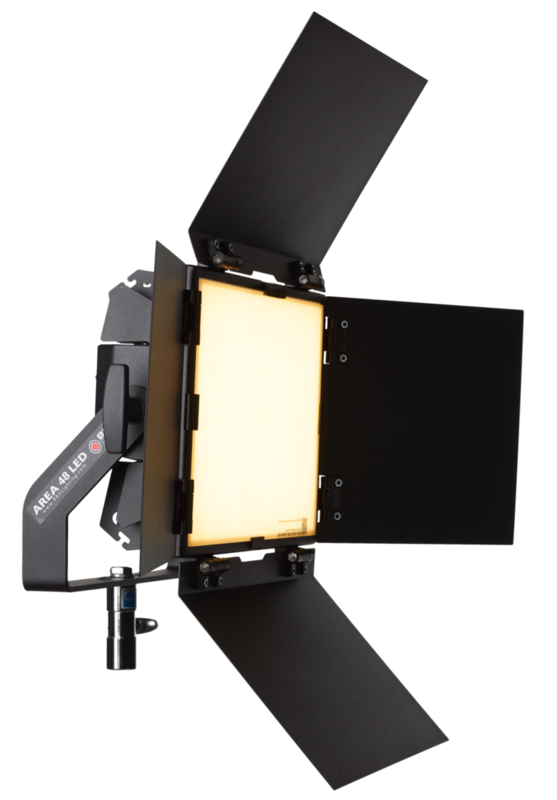 Unveiled to the public for the first time at IBC 2018, Area 48 Colour is the most-compact full colour lighting fixture available on the market today. Area 48 Colour delivers stunning saturated and tinted colours as well as the clean white light at both ends of the spectrum. The fixture is controlled from an all-new touchscreen panel & menu interface, replacing the existing hardware buttons. Sharing the form-factor of the current Area 48 series, all existing accessories – including those from DoPchoice – are compatible with the new Colour model. Fabric-based LEDs are another emerging light type that look set to revolutionise the industry. Korea-based Fomex are experts in ‘non-traditional’ lighting, best known for their Flexible LED range, including FL600 & FL1200. First hinted at IBC last year, their new RollLITE is soon to be publicly available. Operationally, RollLITE maintains many of the benefits introduced with Flexible LED. These include a weatherproof design, ergonomic ballast-style controller and an ‘X-Mount’ to replicate rigid lighting fixtures. However, the fabric-based nature of RollLITE redefines possibilities of how to travel and transport professional light fixtures. Whilst Flexible LED incorporates ‘360° pliability’, RollLITE is truly malleable, making hand carry air travel a very real and useful possibility.